Kimberley Whale Watching – wildlife tours from Broome, Western Australia http://kimberleywhales.com.au 10 day whale watching and wildlife cruises along the Kimberley coast, ex Broome. Mon, 31 Jul 2017 04:54:26 +0000 en-AU hourly 1 https://wordpress.org/?v=4.9.3 37488247	New records of corals from Adele Island http://kimberleywhales.com.au/new-records-of-corals-from-adele-island/ Wed, 21 Jan 2015 01:29:19 +0000 http://kimberleywhales.com.au/?p=3980 Richards, Bryce and Bryce have recently published a paper highlighting the unique assemblage of corals, rollaliths and coraliths at Adele Island, the farethest island off the Kimberley coast. ]]> http://kimberleywhales.com.au/new-locations-rare-species-discovered/feed/ 0 3412	Drones for whale research http://kimberleywhales.com.au/drones-whale-research/ http://kimberleywhales.com.au/drones-whale-research/#respond Tue, 26 Aug 2014 07:05:26 +0000 http://www.kimberleywildlifecruises.com.au/?p=3408 ]]> http://kimberleywhales.com.au/drones-whale-research/feed/ 0 3408	Whale watching magic off Broome’s Cable Beach http://kimberleywhales.com.au/whale-watching-magic-off-broomes-cable-beach/ http://kimberleywhales.com.au/whale-watching-magic-off-broomes-cable-beach/#respond Wed, 30 Jul 2014 13:16:59 +0000 http://www.kimberleywildlifecruises.com.au/?p=3505 We had a wonderful whale watching interaction today with two very curious juvenile Humpback whales. These two young cetaceans approached the boat, diving under and around the vessel, and circling the boat for nearly two hours. The whales were just as curious about us as we were about them, and at one point one of the youngsters lay upside down under the vessel, with both pectoral fins outstretched, studying the underside of the boat. ]]> http://kimberleywhales.com.au/wet-season-wildlife-roebuck-bay/feed/ 0 2089	Spring Tide Sandbank Walk http://kimberleywhales.com.au/spring-tide-sandbank-walk/ http://kimberleywhales.com.au/spring-tide-sandbank-walk/#respond Sat, 22 Feb 2014 13:58:45 +0000 http://www.kimberleywildlifecruises.com.au/?p=3025 On a humid February evening, we took the boat out to a sandbank in the middle of Roebuck Bay to photograph the tropical marine life that is only exposed on this vast expanse of fine, silty sand on a very low spring tide. 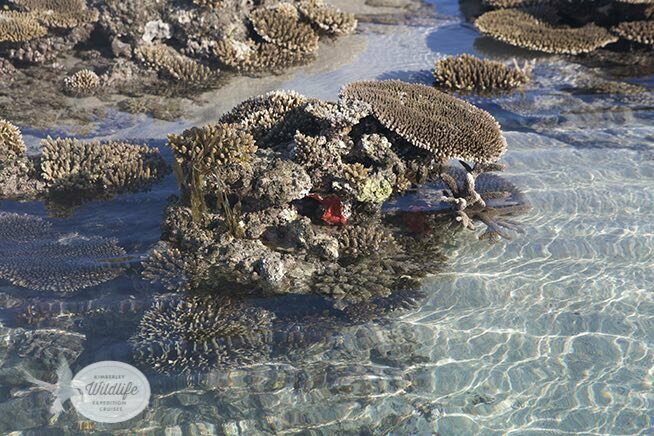 Brightly coloured sponges, Comb stars, Brittle Stars, Feather Stars and crabs littered the sandbank, which covers an extensive area in the middle Roebuck Bay. Of particular interest were the multitude of tiny Feather Stars associated with the sponges and pieces of coral; we counted fifteen on one yellow sponge. We also found a sponge riddled with Five Lined Ribbon Worm, another new find. As the tide receded, Broad-billed Sandpipers foraged in the soft silt towards the water’s edge. These Sandpipers are the only member of the genus Limicola. Breeding in wet taiga bogs in Europe and Siberia, these beautiful little birds spend the boreal (northern) winter around Roebuck Bay, feeding by sight on insects and small crustaceans. Bright orange sponge on a sandbank in the middle of Roebuck Bay at low tide on a spring tide cycle. Colourful giant sponges litter the sandbank on a low tide. Kandy Curren photographing marine life in Roebuck Bay, Broome. A Comb star lies exposed on a low spring tide. Two different sponges on the sandbank at low tide. Walking the sandbank on a low spring tide. A Broad-billed Sandpiper searches for prey on the sandbank. The Sandpiper has a distinctive white eyebrow and a kink in the end of its bill. An incoming tide in Roebuck Bay covers the sandbanks exposed at low tide. ]]> http://kimberleywhales.com.au/spring-tide-sandbank-walk/feed/ 0 3025	Ghost crab http://kimberleywhales.com.au/ghost-crab/ http://kimberleywhales.com.au/ghost-crab/#respond Wed, 19 Feb 2014 22:16:03 +0000 http://www.kimberleywildlifecruises.com.au/?p=2062 A feisty Horn-eyed Ghost Crab (Horn-eyed Ghost Crab (Ocypode ceratophthalmus) adopts a defensive position on Broome’s Cable Beach. Ghost crabs are named for their pale carapace, and this particular species for the protrusions from its eye stalks. Ocypode ceratiphthalmus is found on exposed, seaward beaches, and is active at night. ]]> http://kimberleywhales.com.au/ghost-crab/feed/ 0 2062	Tiny wet season moth http://kimberleywhales.com.au/tiny-wet-season-moth/ http://kimberleywhales.com.au/tiny-wet-season-moth/#respond Fri, 31 Jan 2014 15:09:13 +0000 http://www.kimberleywildlifecruises.com.au/?p=1894 This tiny moth, only 1cm long, appeared after a period of heavy rain in Broome in late January 2014. Moths belong to the order ‘Lepidoptera’ which means scaly wing, and are generally less colourful than butterflies, with no hooks at the end of the antennae. They are nocturnal, and rest with the wings folded flat, rather than vertically as for butterflies.